I have been homebrewing beer pretty regularly for the past two years. Like many hobbies, the number of gadgets and tools that can be added to the hobbyist’s setup are seemingly endless. I am planning on moving from brewing with extract (basically a syrup that is the sugars extracted from malted grains) to doing what’s called all-grain brewing (extracting the sugars from grain yourself). In order to do this, I’m going to need to purchase or build a number of different pieces of equipment. One of those is a wort chiller, a heat exchanger made from copper tubing that is used to remove heat from the boiled wort (or beer) by running cold water through the tubing in order to get it to a cooler temperature where yeast can be added. The yeast will in turn convert sugar to alcohol and carbon dioxide. 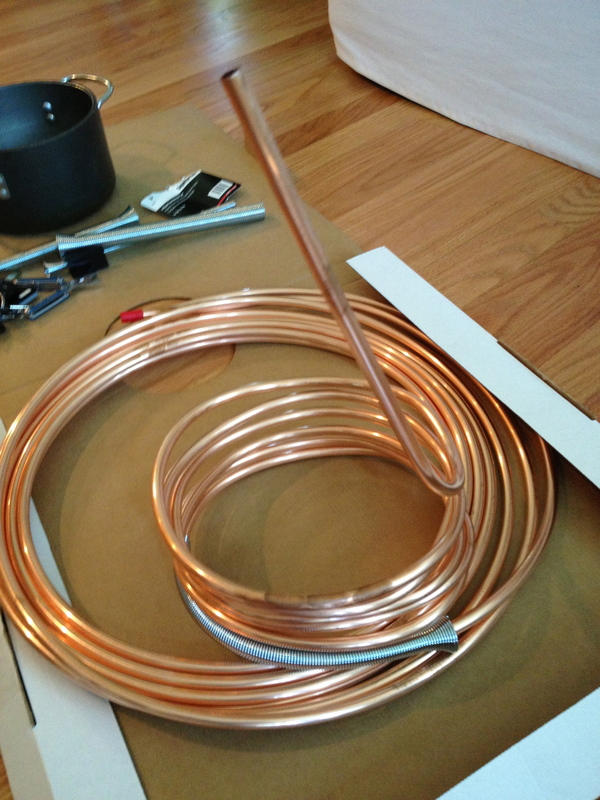 The benefit of using a wort chiller is it gets the wort down to a cooler temperature faster than using an ice bath, thus helping to avoid some complications that can happen such as contaminated beer or off flavors. 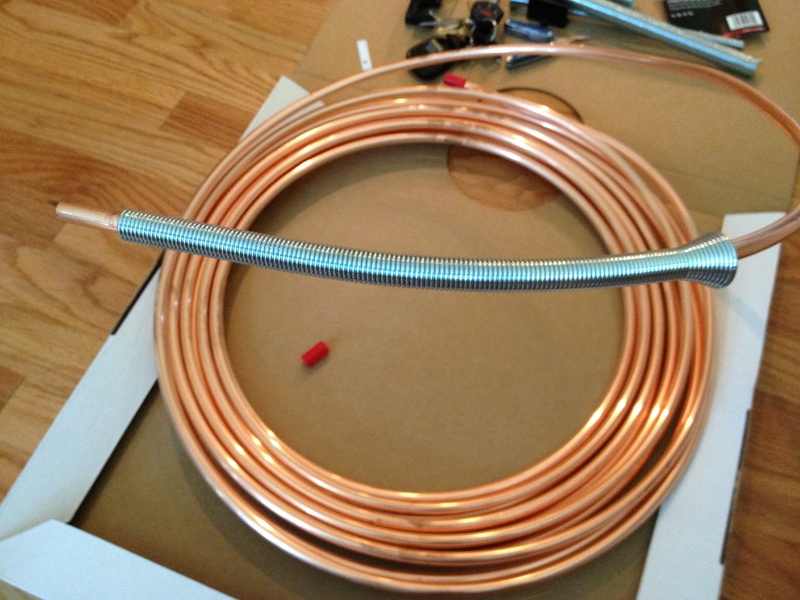 Wort chillers are available online or in homebrew stores, and cost about $60 for one made with 25′ of copper and about $80-90 for 50′ of copper. 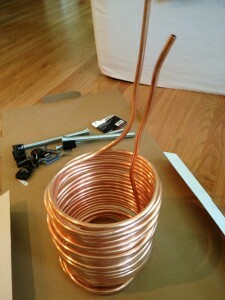 One reason they are so expensive is because copper is currently pretty pricey. 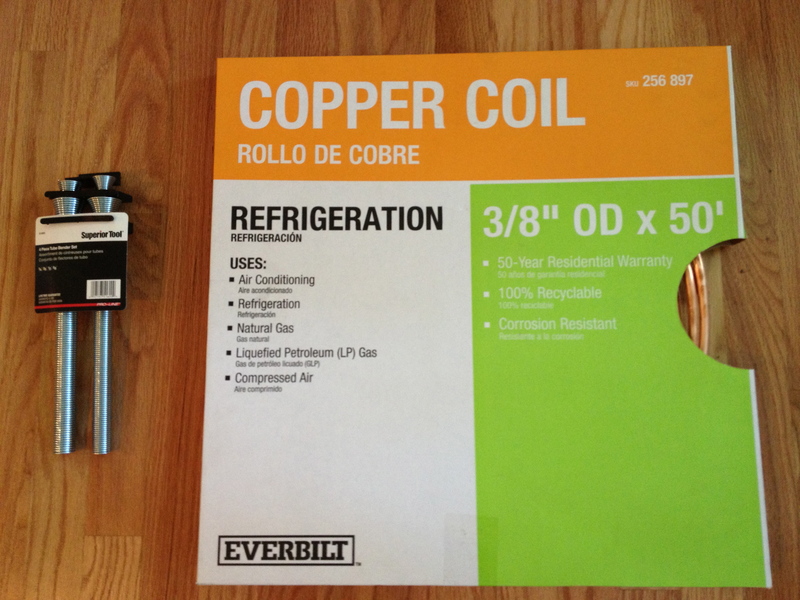 I was able to find 50′ of 3/8″ tubing at Home Depot for about $43. I added two hose compression fittings for about $5 more, and was able to build mine for less than $50. I also bought a tube bending tool to avoid crimping the tubing and ruining my day. 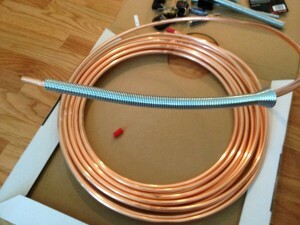 The tubing bender was about $7 at Lowes. These are just springs that are slipped over the tubing and help you to distribute the forces you apply to the tubing as you bend it and thus avoid crimping it. As you can see, the tubing bender has one side with a larger opening that slips over the tubing. I started with a straight run of about 2′, then began creating tight curls, moving the tubing bender down as I made my way through the coil. 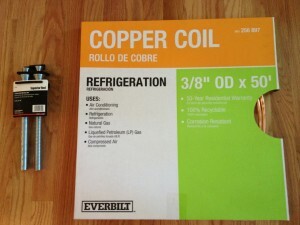 The original coil was about 2′ in diameter, the new curls are about 9″. Eventually, I curled the bottom coil a bit tighter, then brought the end up through the middle and out to the top. I think that in theory, you want this end to be the supply side, bringing the cold water into the bottom of the coil and then working its way out the top. Last, I placed the two hose compression fittings onto the ends, and tightened them with an adjustable crescent wrench. After some leak testing and a bit more tightening, I used this to cool the wort on a batch of beer from boiling to 100 degrees in about 10 minutes. Since I was doing an extract batch, I added cold water to the 2.5 gallons of wort in order to get it to the typical 74-78 degrees needed for pitching yeast. Once I go to all grain brewing, this chiller will need to bring the entire 5+ gallons of wort down to yeast pitching temperatures quickly, and I think it will do a fine job of it. 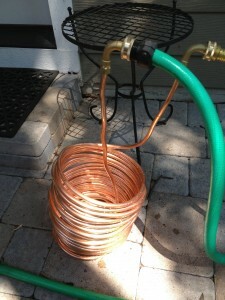 My chiller will not win any beauty contests, but it seemed to be effective and saved me about $40. I still plan to use some zip ties or perhaps copper hose clamps to join the two upright ends of the chiller together to provide more stability to the entire apparatus.